"If Business Casual is the attire of the modern professional, these textures take it to the next level. We made sure our textures are unique, and made these shirts styled with enough details to achieve a result that is modern (whatever that means), yet failsafe. I wouldn’t forgive myself if I ever dressed you to look foolish." Perfect spring shirt. 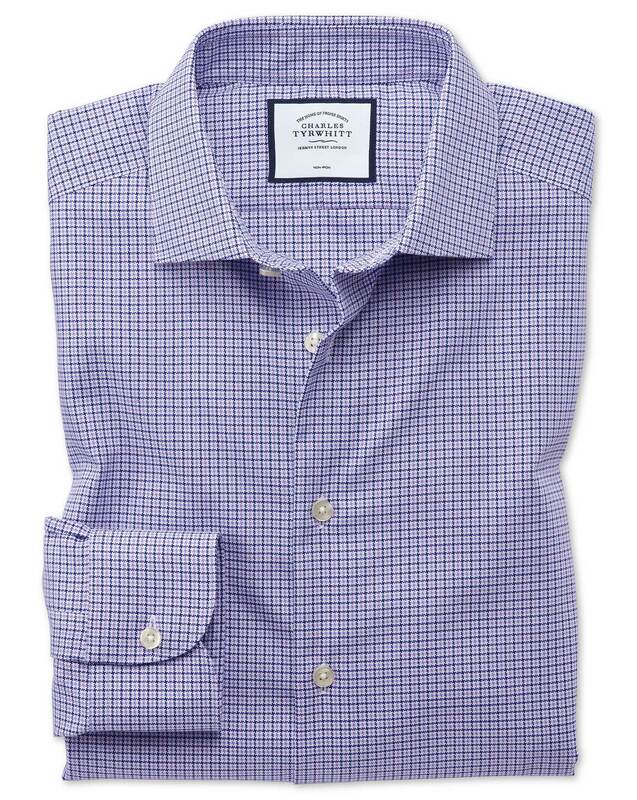 Mix of lilac and blue makes it easy to wear for anyone, not just the stylish. Best fitting shirt ever! Best company in the world! I have bought CT shirts for years - this time was the first time I was disappointed. I was very surprised at how thin the material in these shirts was - not at all as heavy as previous orders. I like English shirts because the past CT shirts were made well with heavy material for cooler winters - these are more like JC Penny summer weight shirts. Disappointed, One shirt only had ONE button hole on sleeves. CT is going cheap - must have a new CEO who cares more about bottom line than quality. Response from Charles Tyrwhitt: It's important when choosing a shirt to ensure you choose the weave which best suits your needs. Some of our weaves (including this one, the Tyrwhitt Cool and the Poplin) are on the thinner end of the spectrum - great for warmer summer days when you need to keep cool. Others (like the Herringbone, Panama and new Triangle Weave) are a little thicker and may be more what you are looking for. We also have the Twill, which is a fantastic all-rounder. All are the same high-quality and made from 100% cotton, it is just the thickness of the weave which varies. We'd welcome you to raise a return with us and exchange this shirt for something a little thicker. Love this pattern. Can be worn with a variety of ties. Looks great without a tie as well. Color combo stands out in the crowd. Material can be a little rough around the neck at first, Gets softer after a few washes.